I’m in deep, deep, deep trouble now… and it’s not just like taylor “fish” (as my kiddies call her – which is odd because she’s obsessed a little with cats – the two don’t mix) “I knew you were trouble” type trouble… no, no… this is your friends drank the bar and your mom is walking up the pathway, think she’ll notice that the rum looks a lot like tea soaked tap water – type of trouble. Let’s take a step back. 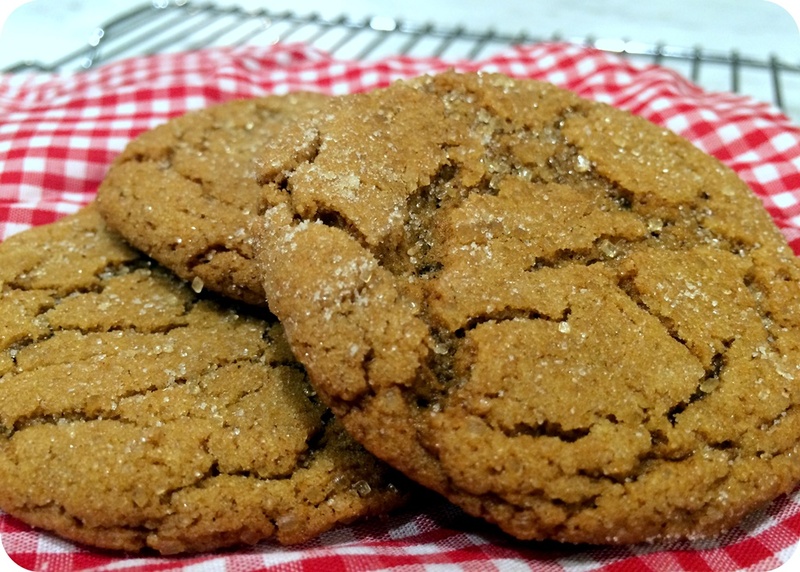 Here I was, just welcomed my first little peanut into this world, and I had a craving for ginger molasses cookies. Just one and I was hooked on a calling that never took a hike. No matter how many places I looked, there was only one gig in town with the perfect cookie… this was a good thing. As long as I stayed far, far away from that place, I was on the road to recovery. That is, until I tried this recipe last night. “Just try making these cookies once,” I said. “They’ll never be as good as the store’s chewy, crunchy, sugary cookies anyway,” I repeated. And with that, out came the standing mixer, measuring spoons and giant jar of dark molasses (it’s sort of the way I christen the Fall season). Well, ugh. Let me tell you. These are actually BETTER by a landslide. And not only that, the provider of the recipe had to go and get all jazz hands with hers by recommending the addition of chocolate chips. I took a chance on her with the second half of the batch (these make A LOT) and well, DOUBLE ugh. SOSOSO good. 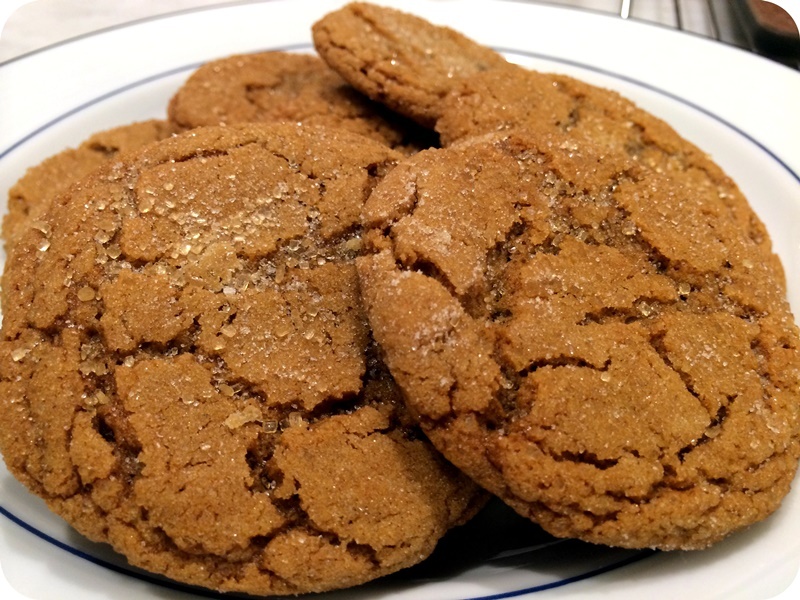 Crackled tops that just let the delicious warmth escape to fill your house, subtle crunch on the outside, nice dense soft centers, topped with sandy crunchy sugar and filled with the smells of fall/winter/whocarewhatseasonitis. So I did what I had to do (which I never ever do, really)…. I bagged them up and handed them out to the various teachers and co-workers who get us through the day. It’s a first, seriously. Typically I would hoard them (from anyone and everything in existence)… but I knew that I would eat then entire 4 dozen, no problemo senor, in 2 days flat. Now what to do with the fact that I have access 24/7?! sigh. In a large bowl, cream butter and shortening. Beat in molasses, eggs, and vanilla. Set mixture aside. In another large bowl combine the flour, baking soda, and spices. Blend with a wire whisk. Drop cookie dough ball into a bowl of sugar and thouroughly coat the dough ball with the sugar. Continue forming balls of dough and coating them with sugar. Place coated balls of cookie dough about 3″ apart on an ungreased cookie sheet. Bake at 350 degrees for 11 minutes. Remove cookies from oven. I lightly press each cookie with a flat spatula to remove any excess air. This keeps the cookies chewy and moist. Store cookies in an airtight container.